Every week we’re asking our summer interns to share some thoughts and responses to various experiences and readings. This week we asked them explore the world of social media. To read more posts from JMM interns, past and present, click here. While I was a little late to the Instagram game (I joined in 2014) it has quickly become my favorite social media platform. I’m a very visual person and I love scrolling through my newsfeed (which to be honest mostly consists of food blogs) of carefully staged, edited, and filtered photos. My favorite posts are a combo of artistic photos, clever captions, and the perfect selection of emojis and hashtags. I think JMM’s social media manager, Rachel Kassman has done an awesome job with our Instagram account. Her voice and sense of humor shines through without overpowering the voice of the museum. My favorite series of posts are #MugShotMonday. I love the hashtag and think it’s a really clever way to show off the many coffee mugs JMM has for sale in its gift shop. I also love the variety of posts. The account features everything from objects and documents in our collections to the various projects staff and interns are working on. One of many fun #MugShotMonday posts. Currently the JMM’s Instagram account has a relatively small following (last I checked we were at 564 followers). I think a great way for the JMM to increase in engagement and its fanbase would be to follow other like-minded institutions on Instagram and its other social media platforms. The National Museum of Jewish American History in Philadelphia (@americanjewishmuseum) and The Contemporary Jewish Museum in San Francisco (@jewseum) are both great accounts for the JMM to follow. 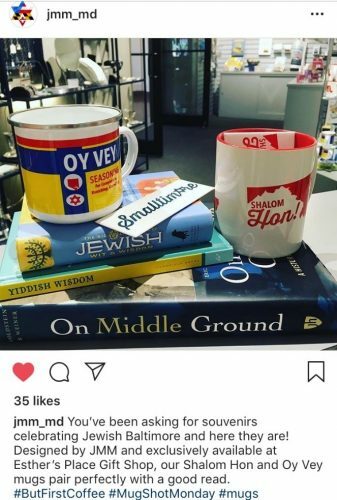 The Contemporary Jewish Museum’s Instagram feed. Interaction with the public is extremely important for museums. Now days museums can engage with their visitors through social media. Social media allows museums to have a personality and intermingle with its audience in a more relaxed way. This also allows museums to know its main audience and expand it. But social media accounts do not only help museums make connections with their visitors, it also allows museums to form relationships with other institutions. Through social media museums can also participate in conversations of current events. 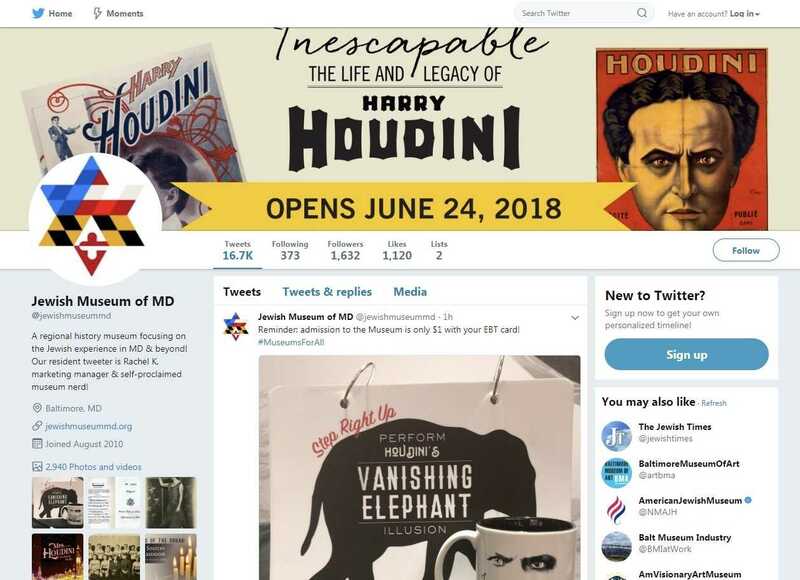 One of the ways the Jewish Museum of Maryland interacts with their audience is through their twitter account (@jewishmuseummd). Jewish Museum of Maryland twitter page. One the things I like the most of the JMM’s twitter account is how it keeps the audience updated on the exhibits and current events. The museum does this by keeping it’s posts short and adding a picture that catches the viewers’ eye. 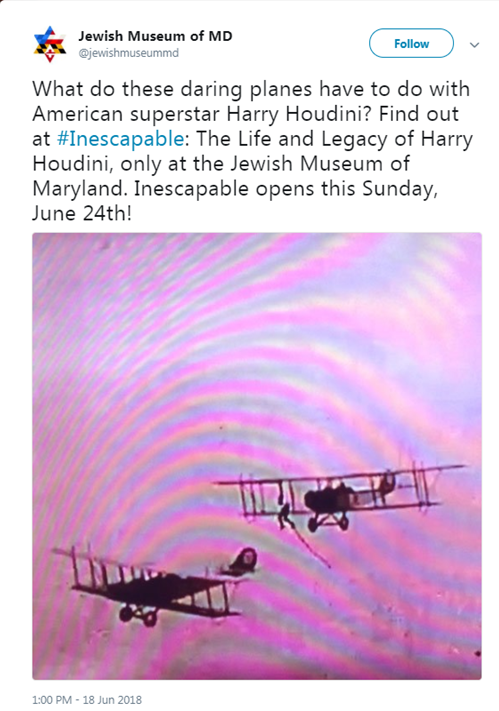 An example of this would be the museum’s promotion of Inescapable: The Life and Legacy of Harry Houdini. To promote the exhibit the museum interacted with its audience by asking questions and showing snippets of the exhibit. My favorite way in which the JMM’s twitter account interacts with its audience is when it shares parts of the Museum’s collection. One of the way the JMM shares its collection is with #TravelTuesday. 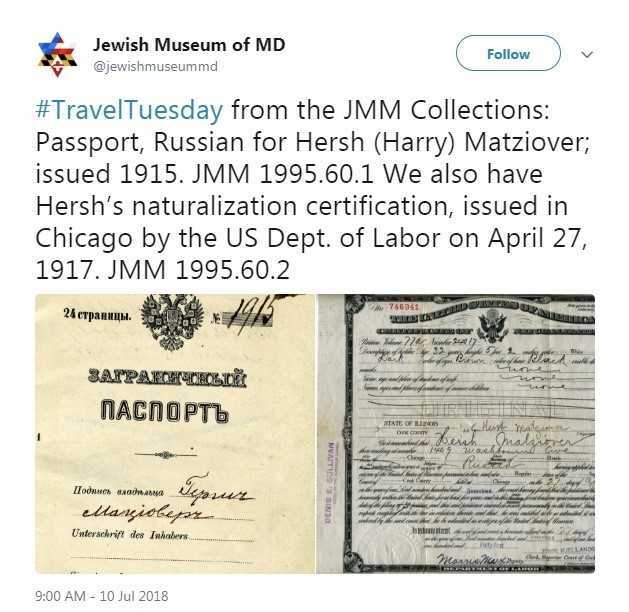 Every Tuesday the JMM shares an artifact of their connection that is related to traveling. The tweets often have a small background of the artifact and a picture, which allows the viewer to learn a new fun fact or interesting topic. #TravelTuesday also allows the Museum to make connections with their current exhibitions: Inescapable and Voices of Lombard Street: A Century of Change in East Baltimore. Jewish Museum of Maryland tweet about Inescapable. Don’t forget to follow the JMM’s twitter account (@jewishmuseummd) and let us know what your favorite part of our exhibits is! If you enjoy the JMM’s twitter account be sure to check out the Wellcome Collection’s twitter account @ExploreWellcome and the Victoria & Albert’s twitter account @V_and_A. Both accounts constantly interact with their audiences through their collections on twitter by making them relatable to them. The accounts also engage with their audience and other museums in a relaxed way. After spending some time investigating our beautifully laid out and designed Tumblr account, I came to the realization that a large amount of our posts on Tumblr are links to our blog, or the same posts on our Facebook page. I think some would say that this reuse of content is a bad thing, but I based upon my knowledge of Tumblr, I believe that it taps into a completely different audience than our Facebook. While our Facebook connects with anyone who has liked our page (or in some cases a similar page), on Tumblr the tagging system makes it so anyone searching a shared tag may stumble accidentally upon our posts. Additionally, Facebook and Tumblr attract different audiences, and thus, the duplicate posts do serve the museum well. My favorite post on our Tumblr, currently, is actually something that doesn’t fall into those two categories. Namely, this was a link to a reading list of books about Jewish women in the LGBTQIA+ community. One of my biggest passions is reading, recommending, and championing diverse literature: the books that are forgotten, ignored, and not often taught in academic institutions. I was thrilled to see the museum taking similar steps on our Tumblr and raising awareness of these books. Overall, I would say that our Tumblr, right now, is a second platform for the posts we write for Facebook, and since Tumblr often attracts a different audience, I think this is a good use of our account. However, Tumblr is also an exciting space in which we can recommend reading, whether books or articles, share different items from our collection, and make connections/collaborations with other local (or even distant) museums. Libraries are just museums that are filled with books, right? I’m just kidding, but seriously, in addition to being a filming location of the original Ghostbusters and a hub for intellectual curiosity, the NYPL does have rotating exhibitions (most notably right now an exhibit on Shared Sacred Sites). The NYPL Tumblr does a great job of balancing reading lists, library events, and items from their collection. The Philadelphia Museum of Art is sharing their exquisite, extensive, and myriad collection on their Tumblr. What I particularly like about their Tumblr are their posts that collect several works of art that are connected by a particular theme. Like this post about waterfalls for instance. Where they can, they also offer multiple, detailed photos that draw the reader’s attention, like this post about a shield painted in 1535. Their Tumblr also provides reminders about upcoming events and serves as an additional outlet to reach new and continuing visitors. The Jewish Museum of Maryland’s Instagram page is filled with little nuggets of Baltimore and Maryland history. From old black and white photographs to pictures of us current interns, the JMM focuses its Instagram page mostly on happenings around the museum and historic photographs from its collections. Out of the more recent posts on the JMM’s Instagram page, the ones that I feel are doing the best put a spotlight on some part of Maryland or Baltimore history, and teach me something I didn’t know before. 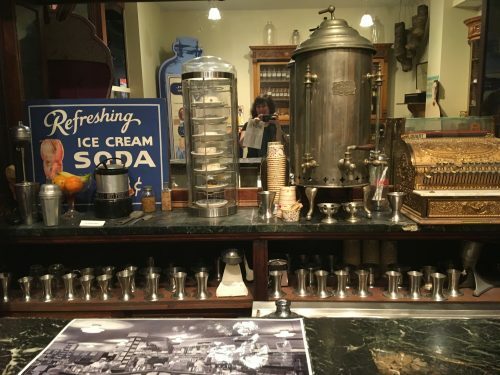 The Hendlers Ice Cream posts, especially this one, taught me a bit about the history and advertising of ice cream in the early to mid-1900s in Baltimore. I didn’t think I would find a description of a “Kewpie,” a cherubic illustrated character, on the JMM’s page, and so this nugget of information surprised me. The small Kewpie illustrations that dot the Hendlers Ice Cream posts are fun and give a joyful energy to the JMM Instagram page. 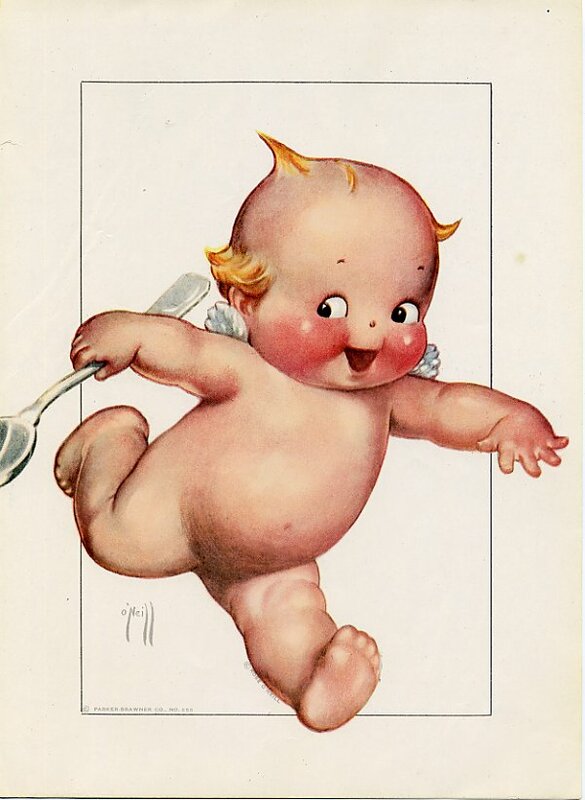 Image of said “Kewpie,” illustrated and signed by Rose O’Neill, via the JMM Collections (1990.180.003). Gift of Maxine Cohen. Seeing how much I like the Kewpies, I would like to see more little tidbits of Maryland and Jewish history in the JMM’s Instagram captions. Because the JMM’s Instagram page has a focus on historic photographs and documents (as opposed to other museums that may be illustration or art-heavy), I feel like the descriptions become very important to the viewer’s connection and accessibility to the artifact and its history. 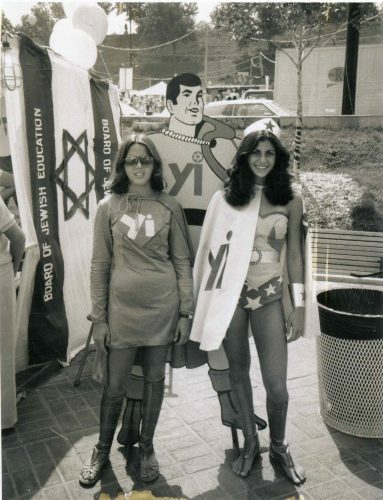 For example, this photo really caught my eye, but the information given about it was that it was of “Shari Cohen and Lisa Vopell at the 1979 Jewish Festival! JMM 1992.108.59.” To outsiders hoping to connect or learn more, I think the names, festival, and number might not be recognizable without further information. Museums can also take distinct approaches on how to use Instagram as a platform. Two museums that I feel are worth looking at for their Instagram, and take different but fun approaches, are The Contemporary Jewish Museum (@jewseum) and The Wellcome Collection (@wellcomecollection). 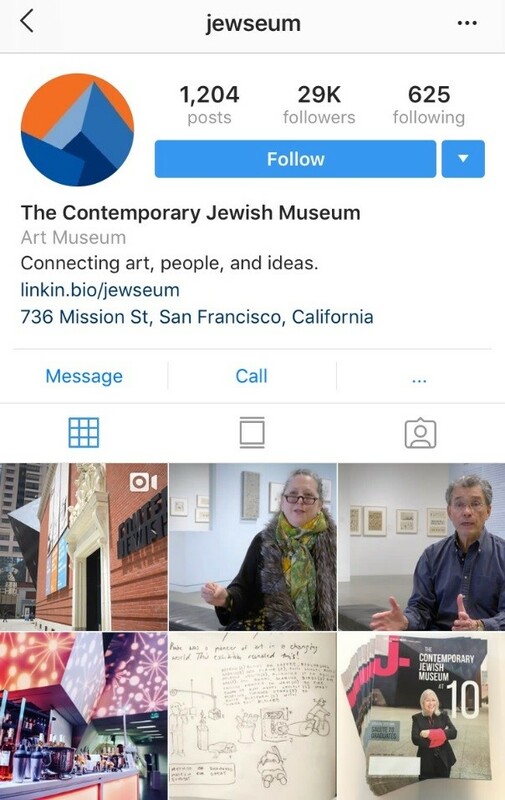 The Contemporary Jewish Museum posts only once every few days, and makes the most of it, using Instagram mainly as a platform for advertising their events and exhibits through high-quality photos. The Wellcome Collection, on the other hand, uses its page as almost a digital look through their collection, while creating a whacky sort of personality through their descriptions and content. They also do a good job of providing ample information (or just enough, depending on the post) while still dividing it up in a digestible way for viewers. As shown with these different accounts, Instagram can become an additional medium to connect with an audience, whether it’s used to advertise, educate, or start a conversation within a museum community. Every week we’re asking our summer interns to share some thoughts and responses to various experiences and readings. This week we asked them to visit a different museum on their own and review an exhibit. To read more posts from JMM interns, past and present, click here. If you’ve ever driven on the Chesapeake Bay Bridge and finally (after the toll plaza and traffic) landed on the other side, you’ve been on Kent Island, Maryland’s first English settlement and a seafood lover’s paradise. 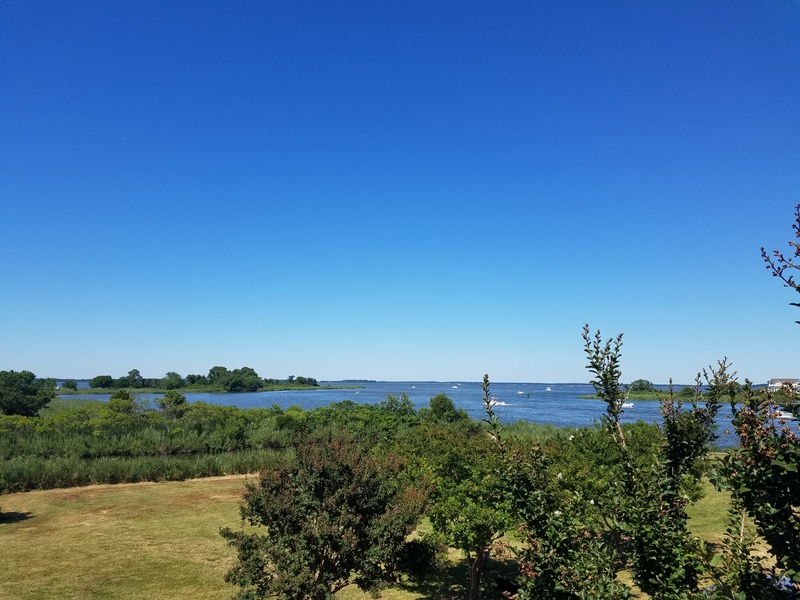 I’ve lived on Kent Island just about three years now and have always been a great deal curious as to it’s colonial, antebellum, and modern history, so I took a trip over to the Chesapeake Heritage Center to check out its fantastic view and learn a little more about the place I’ve been calling home. The historical exhibition itself, while logically grouped into general categories, is a bit of a cabinet of curiosities. Rather than have one central theme or a rotating exhibit, the Heritage Center, likely due to its limited room, tries to tackle multiple topics in one general space; the topics range from the ecology of the bay, the pivotal role of the bay in the War of 1812, local microhistories, and the everchanging modes of transportation. It was the section on transportation that drew me in the most. Split into three sections (trains, ferries, and cars), this part of the exhibit was filled with a variety of historical photos; they depicted maps, construction, mortgage bonds, and people. This picture illustrates Ruth Weston, a Chesapeake Bay Bridge Toll Sargent, and the various items people use to pay for the bridge toll, including a fire hydrant, a wedding band, and radios. 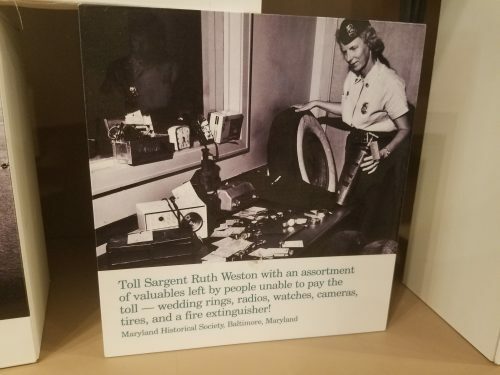 In the photo above, the Heritage Center gives a glimpse of Ruth Weston’s career as a Toll Sargent and raises a great deal of questions: What was it like being a woman working the toll booth in the early days of the bay bridge? Was it legal for her to accept objects as a form of payment for the toll? Who wanted to cross the bridge so badly that they left their wedding band? While the exhibit does not attempt to try and answer these questions, it does certainly spark interest. The transportation section also had artifacts that gave an additional layer. Of personal interest was a program from the dedication of the Chesapeake Bay Bridge (if you’re interested in celebrating with a trip to the Eastern shore, the anniversary is on June 30th). Symbolically placed, the program was put overtop of a photo of a family in a car on the bridge waving at people on the local ferry, representing the passing of the torch from ferries to cars. 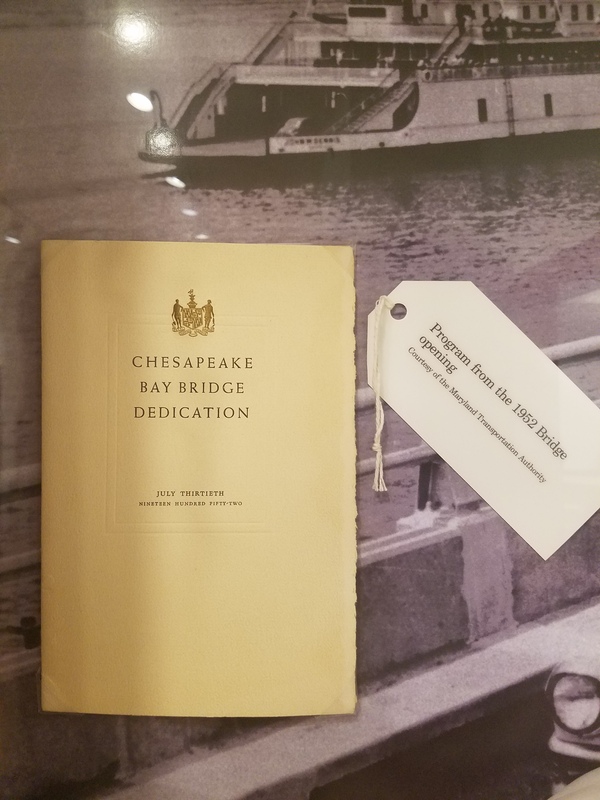 This is one of the original programs from the Dedication Ceremony of the Chesapeake Bay Bridge. While certainly not explicitly stated, if I had to draw a narrative connecting the variety of topics in the exhibit, I would say that the theme is the change, whether it be natural or forced modernization, that has come to the Chesapeake Bay and its communities in the past 100 years. 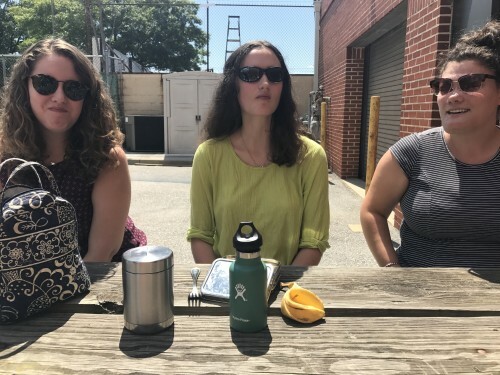 I learned about how our shorelines have shifted from prehistory to today, how the ferries have died out, and how the chemical makeup of the Chesapeake Bay has changed. 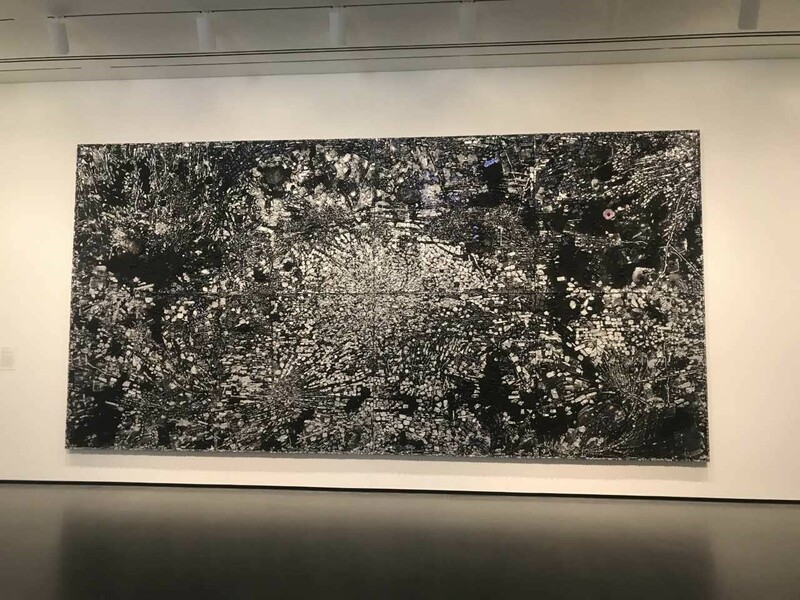 However, I am a lover of details, dates, and names, and I found myself yearning for greater informational depth in an exhibit that is certainly covered in terms of informational breadth. Overall, I would say the exhibit is a good primer for those with a budding interest in our history, or those just passing through on a sunny Friday while on the way to the beach. I went to visit the Carroll County Farm Museum for this week’s blog post. The Farm Museum actually began as the almshouse for Carroll County. Tenants at the almshouse would work on the farm and in other trades. 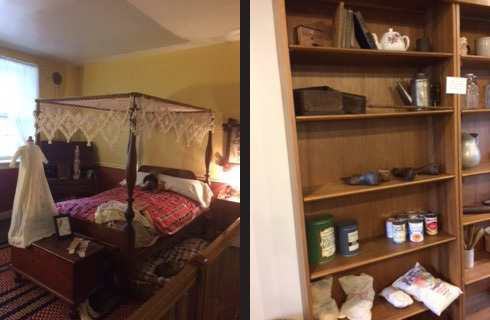 The farm house is set up with period items from the late 1700s to the 1900s. Visitors can see a variety of objects while visiting to the farm house. The bedrooms have trundle beds and traditional mattress ticking. There are handmade quilts and canopies over the beds, and in the children’s room there are handmade toys. One thing that I have never seen or noticed in historic home were small vents with pull chains. These were like old fashioned air conditioning. A docent explained that the vents were used to cool the room in the summer. When it was too hot the occupants simply pulled the chain and let air into the room which would create an air current throughout the house. The day I visited there were not any guided tours but docents were around the entire house in period dress to answer any questions. After making your way through the farm house you cross a small covered bridge which leads to the tenant apartments from the almshouse. Each of the rooms is set up to reflect a different craft or aspect of life in the 1800s-1900s. There was a quilt making room and a sewing room. A kitchen and a tin shop. My two favorite rooms were the veterinarian’s office and the children’s room. I never had thought about vets existing during the 1800 and 1900s. The vets during this period would have been concerned with working with larger animals like horses and cattle but when formal education for vets became common practice smaller domesticated animals like dogs and cats found their way into the vet’s office. 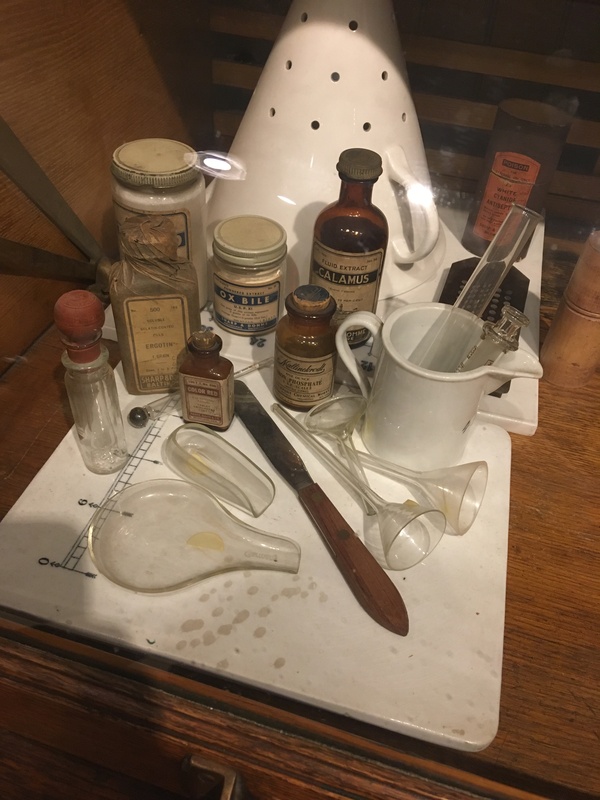 This room had a variety of instruments like glass bottles that once held ingredients for medicines, a scale, and syringes in various sizes. One cabinet had tools of the trade as well as skulls of horses, a fetal calf in a jar, and a heart of a dog that had worms. There was also a taxidermy two headed calf on the wall (though it was not clear if this was real or fabricated). Veterinarians are not something I think of when I think of farms or almshouses so seeing this room was really special and very interesting. My other favorite room was the children’s please touch room. Because I have been working in the education department at the JMM I am always interested to see how other institutions engage children that visit. Everything in this room could be touched and interacted with. There were examples of cans and dry goods bags that one would find at a general store. There was a scale that would have been used to weigh out goods to buy. One section of the room had antique post office boxes and postcards that the children could write and address to their homes and the museum would send them. In another corner there was a coloring area and the coloring pages were all images from the museum. There was an area where children could dress up in clothes from the period and could interact with the space. There was also a small reading area for kids. I thought this area was fabulous. It engaged with children of all ages. There was something for any age child to do and connect with in this space. Parents could enjoy watching their children connect with history in a safe environment and not have to worry about them breaking anything or touching something they were not supposed to. I think that more museums should have more spaces where children can get hands on with the history around them. After leaving the almshouse there are several other outbuildings which can be explored. I did not realize how large of a museum this was before I went. I recommend wearing comfortable walking shoes because there is a lot of ground to cover. In the other building there is antique farm equipment and displays explaining how slaughter houses worked and how cider was pressed. 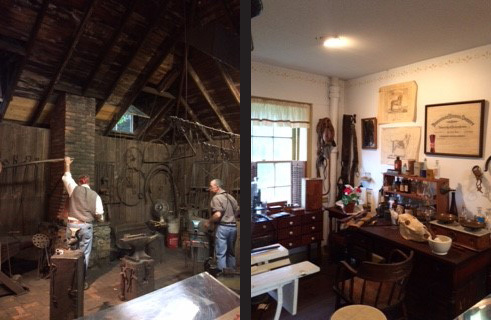 Another interactive part of the museum is the blacksmiths shop. There was a blacksmith demonstration occurring when I was there. It is truly amazing to see this ancient art being practiced. When you walk behind the blacksmith’s shop and follow the path you come across the farm animals that live at the museum. There were ducks, geese, baby pigs and goats, and the two largest residents are oxen. The Carroll County Farm Museum provides a unique learning experience that goes beyond the normal historic home tour. There is something for everyone to see at this museum and something for everyone to connect with. 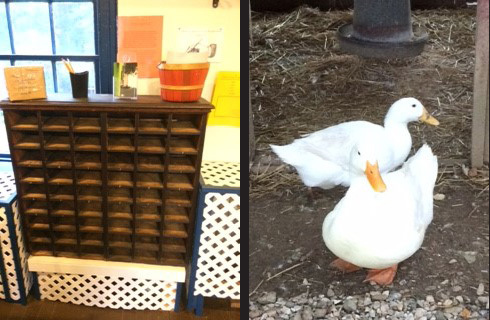 The Farm Museum goes out of its way to be family friendly and has areas specifically designed with children in mind. I learned a lot about the history of Carroll County and about how farms operated. There is so much to see at the Carroll County Farm Museum and I will definitely have to go back to make sure I can take it all in. 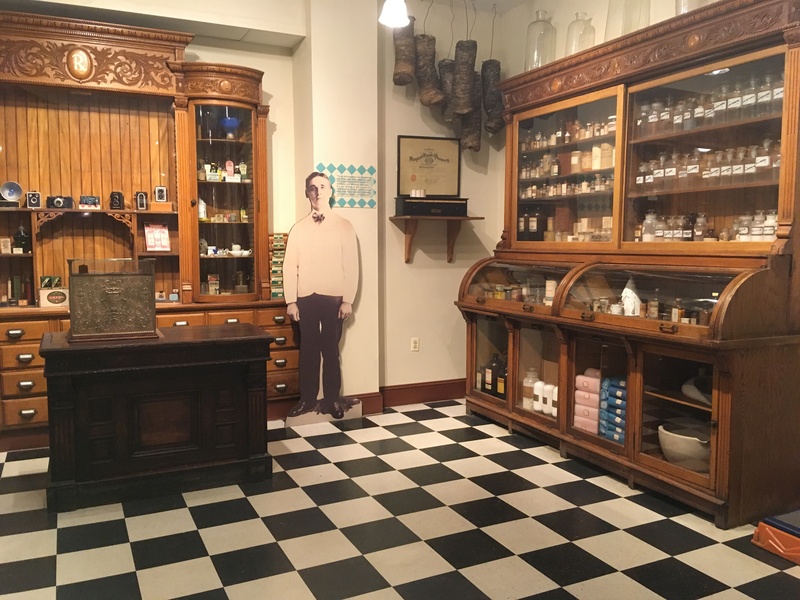 Within the Baltimore Museum of Industry, a small pharmacy sits with its wooden doors wide open. 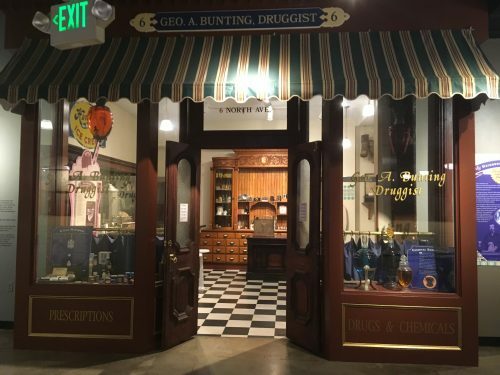 Although this old-school pharmacy no longer serves customers, it immerses its visitors into the history and evolution of Baltimore pharmacies. Complete with a soda bar, a register, and cabinets filled with jars and medicinal ingredients, I was taken in by how charming it was to step back in time for a little while during my museum visit. Picture of the Pharmacy “storefront.” Above the door is a green-striped awning and a “Geo A. Bunting, Druggist” sign. Window displays sit on the left and right side of the door. Reflection of me in the soda bar mirror as I take a picture of the exhibit’s bar. I enjoyed that this exhibit was more of an immersive environment rather than a traditional exhibit. The Pharmacy had only a few captions, preferring to leave the visitors’ curiosity with the items themselves. The captions and descriptions that were included were placed either in the window displays near the door, or at the front of the room, so that they didn’t interrupt the immersive space created. For me, leaving the space mostly free of curatorial text painted a better picture of how an old pharmacy might have looked, and it helped the room feel like it was an actual storefront. Photo taken while looking in from the Pharmacy’s front door toward the right side of the room. Pictured from left to right: A display of cameras in a cabinet, a metal register, and a wooden medicine cabinet. Close-up photo of pharmacist mixing tools. I felt steeped in the time period and culture, rather than feeling like I was just reading about the period, which is an experience I feel is unique to museum installations. I also tend to read everything in museum exhibits, so the few placards and posters included in the Pharmacy provided me with the perfect amount of information to digest in a single viewing. Overall, I enjoyed how the exploration of this space was left up to me as a visitor, because I found it intriguing and inspiring to step into this space and let my curiosity lead the way. Having only been in the city of Baltimore a little over a month, one of the places I was extremely thrilled to visit was the Baltimore Museum of Art (BMA). 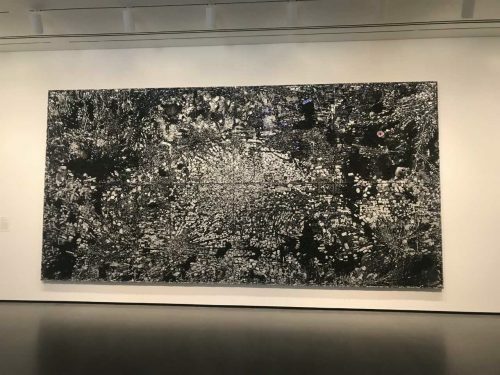 At the Museum, I had the opportunity to visit the new exhibit Odyssey of Jack Whitten’s work. 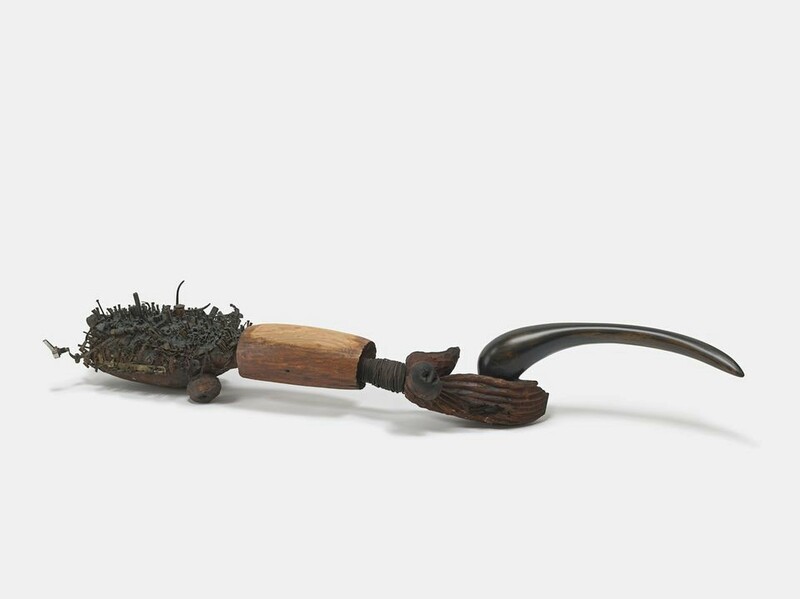 The exhibit displays the evolution of Whitten’s work since 1963 to 2017, through personal items that belonged to Whitten, Whitten’s stories, and sculptures. By doing this, the visitor connects with the art, and has a glimpse of Whitten’s working process. The exhibit is divided on three parts: Whitten’s early work, Greece, and Black Monolith series. Odyssey serves as biography and memorial for the late artist, who died on January 20, 2018. At the beginning of the exhibit the visitor is presented with Whitten’s early sculptures, which the Civil Rights Movement heavily influenced. From his early works, one of the must striking sculptures is Homage to Malcom, which he dedicated to Malcom X. This piece is completely asymmetrical and combines different techniques and materials, which make the piece even more powerful. Homage to Malcom. Via The Art Newspaper. The first room of the exhibit also contains a large picture of Whitten’s studio, allowing the visitor to see where Whitten created his art and got his inspiration from. This photo in conjunction with his personal notes, allow the visitor to see the process Whitten followed when creating his sculptures. 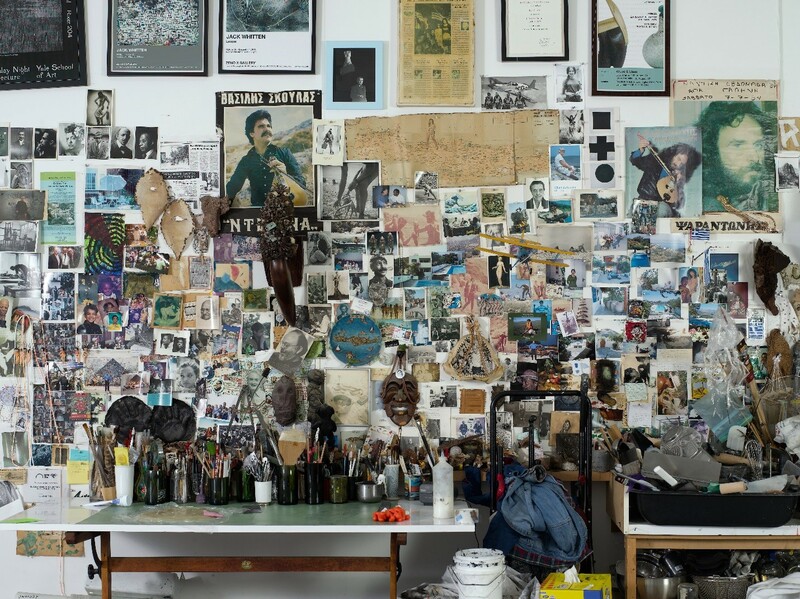 Having a picture of Whitten’s studio and reading his personal notes also forms a bond between Whitten, his art, and the visitor. Jack Whitten’s studio wall. Via BMA. Because his wife had family in Greece, Whitten spend a great amount of his time there. An anecdote that stayed with me after the exhibit was regarding Whitten’s first visit to Greece. There, he dreamed with a large piece of wood, which he later found during his stay and created a sculpture. The stories behind Whitten’s work and the Greek sculptures from Minoan and Mycenean Greece that are found through the exhibit, transport the visitor to Whitten’s experiences there. The third part of the exhibit focuses on the Black Monolith series Whitten created. Whitten’s series contrast heavily with the rest of the exhibit because of the dark and vibrant colors they have. The most striking piece of the series is Atopolis: For Édouard Glissant. To create this piece, Whitten layered paint to make it look as it were small tile pieces. Atopolis is Greek for “without place.” The tittle of the piece contrasts with the scene that is shown. Atopolis depicts an aerial view of a city, from its main hub to the more spread out areas. The large piece attracts the attention of the visitor from the moment they enter the room. Odyssey is a spectacular exhibit that showcases the work of a significant artist that was able to influence the world through his art. Be sure to visit the exhibit at the Baltimore Museum of Art! The National Building Museum’s permanent exhibit, “House and Home,” employs various exhibition techniques to help visitors explore the various social and cultural meanings and connotations of the American “home.” The exhibit utilizes several components including objects, photographs, models, film, timelines, maps, and text panels. These various components make the exhibit accessible to people with different learning styles by allowing them to focus on the aspects of the exhibit that interest them the most. The variety of exhibition techniques also keep the audience engaged by preventing the monotony of an exhibit solely comprised of a single component. The primary purpose of the exhibit is to convey how a house becomes a home and show what “home” means to a diverse group of Americans. For the most part, this message is successfully conveyed throughout the exhibit. The first room features walls of photographs that depict different families and their homes and the various activities that take place in their homes. The theme of diversity carries on into the next room which features a wall of household objects and includes many multi-cultural objects such as a mezuzah, a tortilla press, and an Islamic prayer rug. This theme is reiterated on the left side of the room which features full scale models of different construction methods which exemplify just some of the many diverse styles of American homes. The models of iconic houses in the center of the room such as Frank Lloyd Wright’s “Falling Water” also emphasize the variety of American homes and highlight houses that were the first to experiment with certain construction techniques and designs. 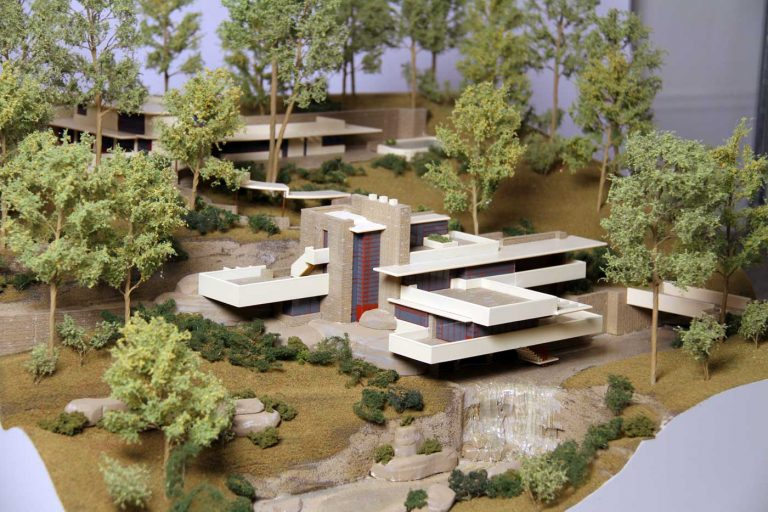 Model of Frank Lloyd Wright’s iconic home “Falling Water.” Image via. “House and Home” is an object driven exhibit. The highlight of the exhibit and the section visitors appeared to be most drawn to is the wall of household objects. 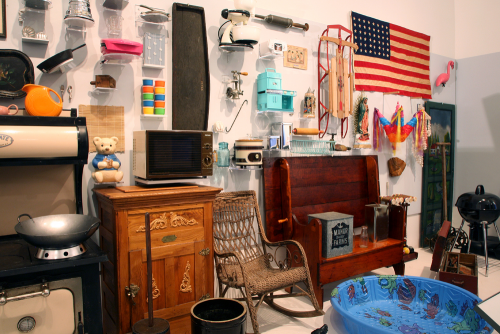 These are objects that are familiar to most visitors and evoke an emotional or nostalgic response. At first glance these objects appeared to be displayed randomly. The objects had no context and were displayed next to objects from different time periods. For example, a beanbag chair from the 1980s was displayed next to a slipper chair from the 1850s. At first, I found this arrangement confusing and frustrating but once I realized that the objects were organized by room (i.e. kitchen, yard, living room) I gained a greater appreciation for the display and the message the curators were trying to convey. Throughout history and across social lines people have chosen to furnish their homes with objects that represent themselves and their pasts. These ordinary objects reflect their owners’ ideals, values, and aspirations. Objects and houses represent the lives of the people who own them. The Object Wall. Image via. While most of the objects in this section are familiar and easily recognized by the audience, label panels below the objects provide context and authenticity. Each label panel features a basic drawing of the outline of each object which is numbered and corresponds to the text label which briefly describes the object and its provenance. Unlike the dollhouses and the model houses, the objects in this section are not displayed behind glass. The only barrier between the visitor and the objects is a low wall and a few feet of space. The lack of glass could indicate that these objects are less important than most museum objects, however this was an intentional decision on the part of the curators and exhibit designers. The lack of glass makes these objects more accessible. These objects are everyday objects that visitors already have a connection to and displaying these objects openly increases the visitors’ connection to the objects by giving them the sense that they can reach out and touch them. “House and Home” is a fairly accessible exhibit. The flow of the exhibit is clear and linear. Each room flows into the next room preventing the visitor from getting lost or confused. The objects and models in the exhibit are arranged so that they can easily be seen by all visitors. The dollhouses in the first room of the exhibit are encased in glass and placed in the center of the room so that visitors can easily move around them to view the rooms from different angles. Similarly, the models of iconic houses which are displayed in the next room are placed in the middle of the room and are low to the ground allowing children and visitors in wheelchairs to view them more easily. Every week we’re asking our summer interns to share some thoughts and responses to various experiences and readings. This week we asked them to look back over the summer and to reflect on what they’ve learned, share some favorite memories, and give us some updates on their projects. To read more posts from JMM interns, past and present, click here. The Beth Am project is going swimmingly! So far there are ten interviews, six of which I conducted, with full transcriptions. This adds up to over eight hours of oral history content, and I will be fitting in one more this week! In addition I’ve made contact with five individuals who weren’t available over the summer, but are happy to be interviewed this fall so the project is going to be running full force forward. Beth Am is well on its way to an amazing video commemorating the 100th anniversary of the temple building! I’ve had a great time becoming immersed in the history of Beth Am and have had a wonderful time working with people’s stories. My favorite memories from this summer are definitely every interview. Being allowed to enter someone’s home and ask them to share their memories is an incredible experience. The majority of the folks I interviewed were retired, which I imagine meant they had time to perfect their decorative skill, because every room I interviewed in was gorgeous. I got to collect all kinds of stories. Some highlights include elephants at Druid Hill Park, Jewish exclusion from Roland Park, details of the Harbor Place renovations, stories of meeting and falling in love, moving to and living in Baltimore City, making Bat Mitzvah corsages out of war stamps, innumerable stories about Dr. Louis L. Kaplan, working in and for Baltimore City, and all of the work that went into getting Beth Am, the self-described do-it-yourself synagogue, up and running. In my sociology course work I’ve read countless ethnographic pieces that depend on interview material, but I hadn’t done any hands on work to discover whether this kind of research is something I would enjoy. After this internship I can say for certain that interview work is a definite positive! I’m only entering my junior year of undergrad so I have some time to figure out where I’d like to end up. This internship has helped me find the connections between what I’m studying and museum work and has really introduced the field as a possibility. This internship has taught me a lot about the importance of the programs and education departments of museums, two areas that did not immediately come to mind when thinking about museums prior to this summer. I learned a lot about determining what factors to take into consideration when planning a program as I searched for potential speakers, performers, and films to host at the museum. I also thought a lot about how to create educational materials and experiences that would be appropriate and compelling for a wide range of students. When doing educational work, we always had to consider how it would illuminate the exhibit in question and make it more accessible to the students hoping to learn from it. We also had to tailor activities keeping in mind students’ level of familiarity with Judaism, sometimes putting together activities that could work for both non-Jewish and Jewish students, as well as separate activities to ensure a more meaningful experience for both types of students. I loved all of this work and can definitely see myself continuing to do it in my future. I love that it requires you to stay on your feet, think creatively, and interact with a wide variety of people. As I look back on this summer, a few memories stand out. Erin and I were tasked with documenting the cracks on the very old walls of the Lloyd Street Synagogue. Although sometimes the going got tough, I had a great time posing with our makeshift whiteboard and a yardstick next to a crack on the wall in the heat of the balcony as Erin took photos. I even managed to stave off the temptation to be in every photo. Interacting with student tour groups was one of my favorite aspects of the internship. 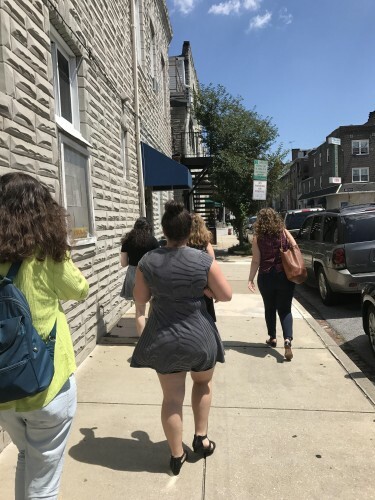 We recently hosted the junior ambassadors from the United States Holocaust Memorial Museum and I really enjoyed watching them do the same workshop about Jewish refugees to Baltimore that the interns had done earlier in the summer with Ilene. They had so much important knowledge from their work as Holocaust educators that they were able to bring to the activity. I also loved when the Bell Camp for blind children visited. I painstakingly put together a craft for the kids that would enable them to make stars of David out of popsicle sticks and Velcro. It ended up being more difficult than I thought it would be and not everything went as planned, but it was definitely a valuable learning experience for which I am grateful. 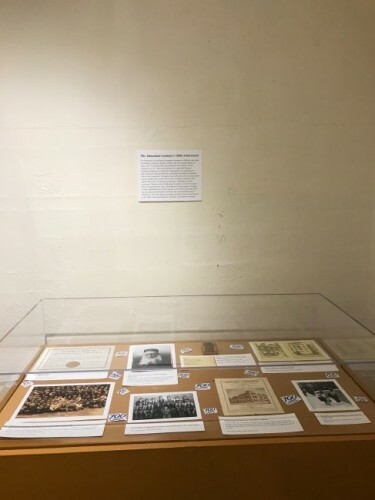 One of my proudest accomplishments this summer has been the mini-exhibit that Erin and I designed for the case in the basement of the Lloyd Street Synagogue. To commemorate the 100th anniversary of Baltimore’s Talmudical Academy, Erin and I carefully crafted a display using artifacts from the JMM’s archives. 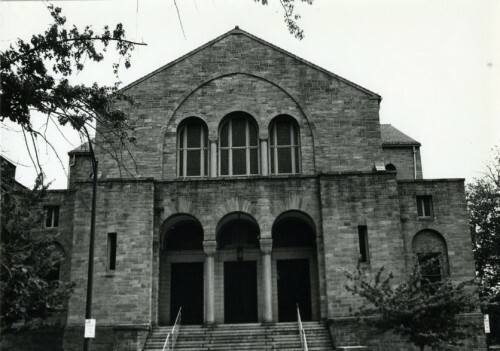 We feature photographs old and new and real artifacts from TA’s earlier years like a fundraising brochure for a new building in the 1930s and a beautiful, miniscule prayer book. As of yesterday, the display is up and ready to be viewed. I hope people enjoy it and appreciate the connection between TA and the Lloyd Street Synagogue, both homes to Rabbi Schwartz. As our last week comes to an end, we are continuing to work on preparing for the Summer Teachers Institute on Holocaust education taking place next week. Erin and I have been working hard coordinating the three-day event’s logistics and it is shaping up to be a great experience with many learning opportunities and compelling speakers. Also looking ahead to the future, Erin and I finished putting together an educational resource to accompany the JMM’s upcoming exhibit Discovery and Recovery: Preserving the Iraqi Jewish Archive. We did our best to come up with ways to teach the complicated history of Iraqi Jews to students of all grade levels in a meaningful and engaging way, and I’m looking forward to this resource being put to good use. Well, here I am 10 week later from my first day back in June. These last 2 months have been full of many long work days and experiences, and I’m happy I got to have this opportunity. I started out this internship as a recent college graduate, I had no prior experience in museums nor did I even have an internship before. Then I found myself working for the Jewish Museum and I could not have been more excited. 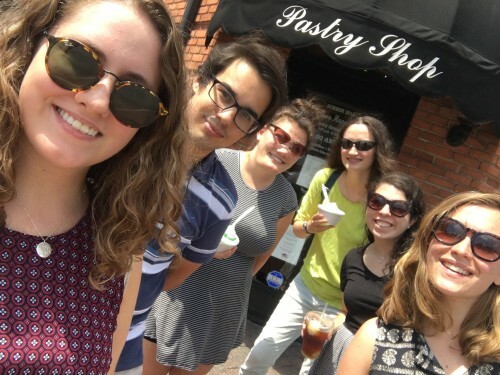 All the interns as we walk back from getting delicious desserts from Vaccaro’s Italian Pastry Shop. I will miss all of them and the fun times at lunch we had together! I learned a lot about Museums that I honestly did not know before. One thing that continuously sticks with me is the idea of the Museum being like a business. This came from Marvin’s workshop a few weeks back. I see a business in this museum and in others, from Tracie working the phones to Sue planning the Volunteer Appreciation dinner, there are literally so many aspects to a museum! I also learned that as each department works separately from one another, all of them need to be in balance as they work with one another. The Collections Manager needs to work with the Curator, the Curator with Marketing, etc! The Staff depends on one another and when they all work hard they get wonderful results, such as the Just Married exhibition. 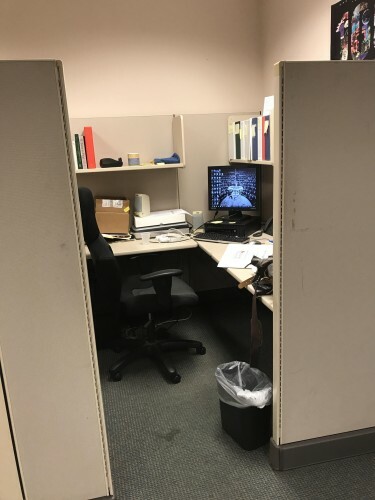 “PastPerfect Cubicle A” aka my work station and my home away from how for the past 10 weeks. I’m leaving this internship having put a small mark on the upcoming exhibit: Belonging(s): What Connects Us, which will open hopefully in 2019. I did three projects this summer: A character profile on a Jewish Socialist, research on the Maryland Jew Bill, and I started what is perhaps the Museum’s first real in-depth research on converts to Judaism. I hope that what research I did, what quotes I catalogued in excel, and even the siddur I donated to the Museum will help the upcoming exhibition in some way. For myself, as a convert to Judaism, to work in a Jewish Museum being surrounded by Jewish History and helping preserve it and even contribute to it has made me immensely proud and affirms my new Jewish identity. I will miss all the interns as we go our separate ways, and I will miss the JMM staff as well. This museum and this internship defined my summer 2017. It’s tough to say goodbye, but I’m ready to move on to grad school and what awaits me in Montreal. 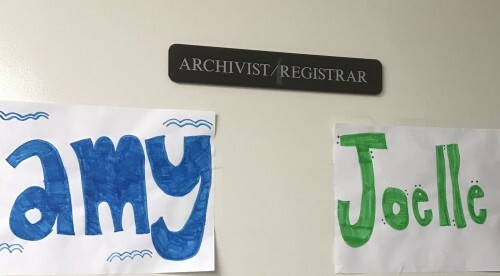 It seems strange to me that my time interning at the JMM is almost over. During my ten weeks here I have learned more about museum functions and have been able to narrow down future career paths. I learned about handling textiles and putting together a traveling exhibit. Prior to this experience I had always envisioned a future career as a curator. This internship has expanded my interest to collections, especially since curators for exhibits can switch in and out and be outsourced. I find that I enjoy working with physical objects more than research sometimes. The interns at the Just Married opening. 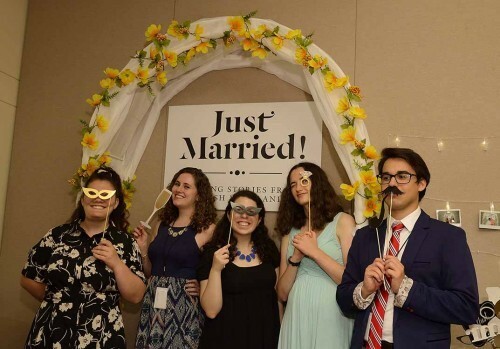 Some of my favorite memories from this summer include forming friendships with the other interns, planning intern night, and helping put together the wedding exhibit. Joelle and I had fun working together in the basement and I will never forget the daily intern lunch talks and our trip to Vaccaro’s. I also really enjoyed going on a mini field trip to look at a possible accession: two large gilded lions. Most of the collections projects have been wrapped up – quite literally in some cases. The traveling exhibit is mostly condition reported and packed besides larger items that need specialized crates. Our files have been organized and new accessions have been put into PastPerfect. Our podcast is finished and edited and will be up shortly too. Ultimately, as the summer has been coming to an end so too have been our projects. There is one last remaining thing to look forward to however: The Summer’s Teachers Institute next week; I am excited to learn about teaching the Holocaust and visiting the Holocaust Memorial Museum in D.C. In one of the first workshops for the interns, Marvin asked us about our museum story. I have always loved museums whether it was a day trip with my family or a school fieldtrip. They were always a place that made me feel comfortable and excited to learn. 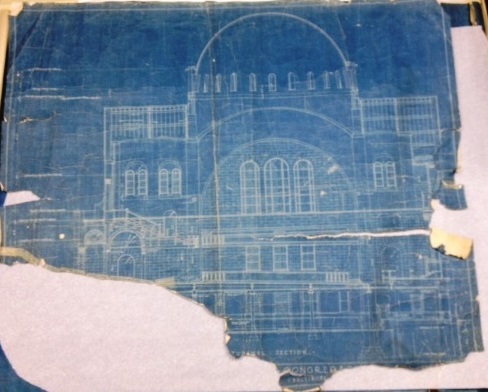 Ten weeks later, I have an even richer and more personal museum story. I have been able to help every department in both big and small ways. With Just Married!, I was able to help steam the dresses to ensure they were picture perfect for the exhibit. 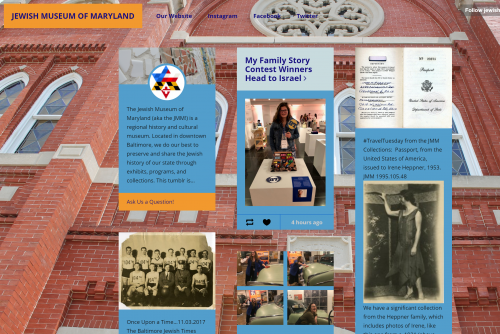 I was lucky to help create posts for all of the Jewish Museum of Maryland’s social media platforms. My specific work with education and programs has provided me with great lessons about the inner workings of both museum education departments and programs. There, I’ve had projects that ranged from creating curriculum for students to organizing the crafts for family day programs. This internship has added a huge chapter to my museum story. Here I am with the other Summer interns. Now when I think of museums, each one of them will be included into my Museum story. This internship has been full of great and educational memories. I loved helping with intern night gathering the prizes and calling companies. It felt like I was in a race across town to get every last gift card and certificate in a ten mile radius. I also loved being able to sit in on the staff meetings. It was so fascinating to watch the JMM’s staff tackle the upcoming weeks in a fast-paced and exciting environment. I challenged myself to transcribe what each staff member shared. I am excited to look back on the minutes and reflect fondly on the experience of seeing everyone at work. 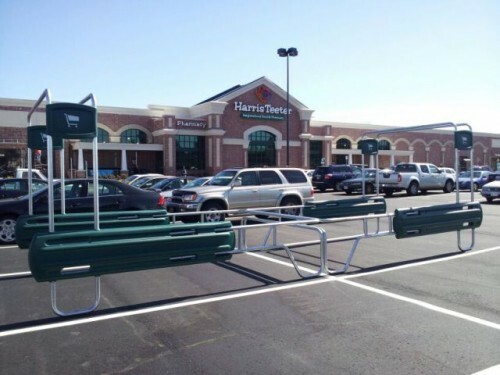 Harris Teeter was one stop on the hunt for great intern night prizes. With the internship wrapping up, the education interns’ projects are in great shape. Our research for the Iraqi Jewish Archives lent itself over for education tools and activities for future school visits to the museum. Our experimental crafting and googling will be used to ensure Iraqi Family Day and other programs are a total blast! The search for Jewish entertainers and performers will help create an exciting line up for JMM Live in March and April. The Lloyd Street display case is now exhibiting our designed and curated look into Talmudical Academy’s 100th year. 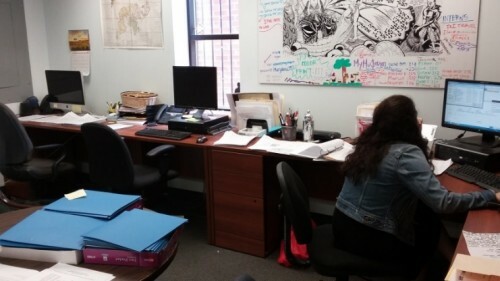 Summer Teachers Institute opening day quickly approaches and the education interns are making sure the event runs smoothly creating folders and organizing the resources. While most of the projects from the summer will not go into effect until after the internship is over, they allowed me to dive into museum operations and really give back to the JMM. As the internship draws to a close, it is nice to reflect back on the past 10 weeks. As a recent graduate, I went into this summer hoping to explore different interests and gain new experience. Ultimately this summer re-enforced many of future goals and raised new questions for me. In the basement, but not forgotten. Our fellow interns made us these name signs! We have wrapped most of our projects up. Over the past couple months we have inventoried a portion of the collection, packed boxes to send a JMM exhibit on the road, and processed new donations. Inventory is ongoing, but we definitely made some a sizeable dent in the list. It was a fun project to begin the summer with, as it gave us the chance to explore the collection. I really enjoyed spending time with the other interns and our daily lunch conversations. Highlights from the summer include taking a small trip to look at a recent accession and planning intern night. I loved having the opportunity to live in and explore Baltimore including visiting other museums and going out to dinner with fellow interns. I am looking forward to the Summer Teachers Institute next week and excited for new adventures!